When I originally wrote my books MMOs from the Inside Out and MMOs from the Outside In, I was intending to self-publish them. I'm useless at self-publicity, though, so was hoping to try my luck with a professional publisher instead. Before I got to the stage of writing query letters, one approached me. The book wasn't suitable for them, but was suitable for one of their other imprints, which is how I wound up getting them published by Apress. My vision for the book was very different to theirs. Here's a sample (half-size for convenience). On the left, two pages from one of the books as Apress published it. 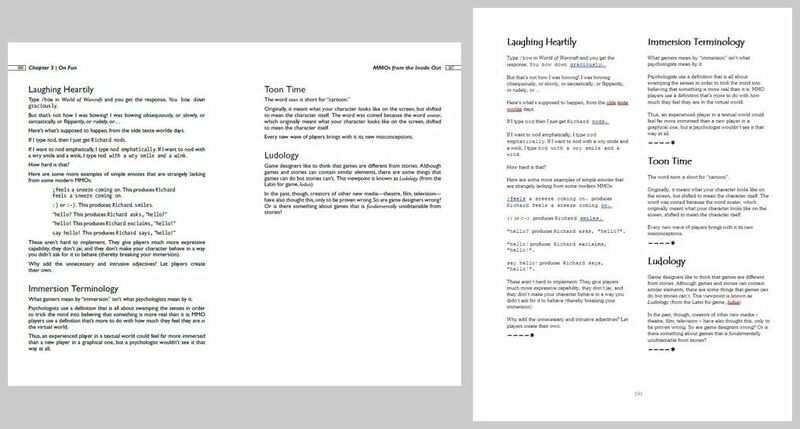 On the right, the corresponding single page as I was going to publish it. Well, almost: I wasn't keen on the typeface for the headings and I was going to put a one-liner (of which I had prepared several hundred) at the bottom of the left-hand column; it does give a reasonable idea of what it would have looked like, though. As it happened, Apress weren't good at publicity either and sales of the books are extremely disappointing. I guess it could be they're great at publicity when they try, they just didn't really try. I often wonder whether I'd have sold more copies of the books if I'd self-published them.